The address of any of the One Breckenridge Place townhomes for sale is Park Avenue, and the style is urbanely compact. The architecture is low - not a copy of historic Victorian - but expansive with vaulted ceilings and wide picture windows. These are topped with triangular eave windows that let in more sunlight and maintain privacy. Spacious three-bedroom One Breckenridge Place townhomes a stone’s throw from the performing arts center, in a ski-town style residential neighborhood - that’s the meaning of the address One Breck Place. The two-level floor plan has a “scissor entry” with living, dining, kitchen and master bedroom up, more bedrooms down. A large deck or patio extends off every One Breck place, which also comes with a garage and basement. Read more about Breckenridge real estate, or begin your search with the One Breckenridge Place townhouse listings below! The 39 homes in One Breck Place are clustered together so there’s no yard maintenance, but are surrounded by a small greenbelt. A few steps west is the community swimming pool that serves the Upper Village condos and this property, too. Remodeled in 2009, the pool is mostly outdoor, but partially inside a small clubhouse, which also has changing rooms. The pool is set back in the trees off Village Road, and enclosed by a privacy fence. Across Park Avenue from One Breck Place is the Riverwalk Center where two classical music groups are resident players, and other concerts and plays take place. Shops and restaurants on Main Street are just beyond it. City Market is on the other end of Park Avenue, but the free town bus serves both ends. 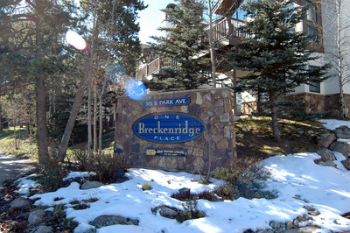 The Village at Breckenridge is steps away, catty corner from One Breck Place. A short walk through the village leads to the base of Peak 9 and the Quicksilver Lift. Free transportation services run by the ski resort, the town and county link One Breck Place to all the ski mountains in Summit County. Size: 1785 sq. ft. to 1805 sq. ft.
On the corner of Village Road and S. Park Avenue, across Park from the Breckenridge Riverwalk Center, near the Village at Breck. From Main Street turn onto Park Avenue either at the traffic circle on the north side of Breckenridge or near Main Street Station on the south. Coming from the south, the One Breck Place driveway is the first left-hand turn after Village Road. From the north it is one-block past Four O’clock Road, on the right. Are you ready to find real estate opportunities in One Breckenridge Place? Send us a message online to get in touch with an expert. Listing information last updated on April 22nd, 2019 at 4:18am MDT.